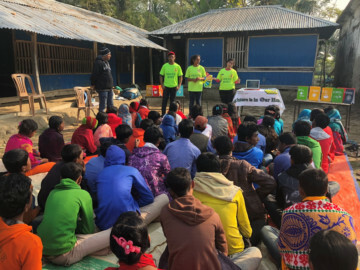 Dubai: A five member team from my foundation Green Hope, consisting of student volunteers from the UAE and Canada, spent 10 days engaging rural women and children in remote parts of Bangladesh in the sustainable development process. Our mission was to realise the United Nations mandate of “Leave No One Behind” as we march towards a sustainable future. It was an unbelievably moving experience — our efforts were like a drop in the ocean but we feel that we have planted some seeds of change, which will surely bring about greater inclusivity. We spent last Christmas with the Rohingya refugee children at a camp on the outskirts of Cox Bazaar on the border of Myanmar and Bangladesh. Although we had seen images of the issues they face on television, the ground reality is far worse. More than a million Rohingya refugees live in these camps, cramped in about 30,000 ramshackle huts and plastic structures, spread across the hilly terrain. Sanitation and hygiene do not exist. It’s an unbelievably moving sight which no words or pictures can describe. The world seems to have forgotten them. Every day 50 children are born — many unable to survive beyond the first week. Abuse, exploitation, trafficking add to other issues like hunger and disease. 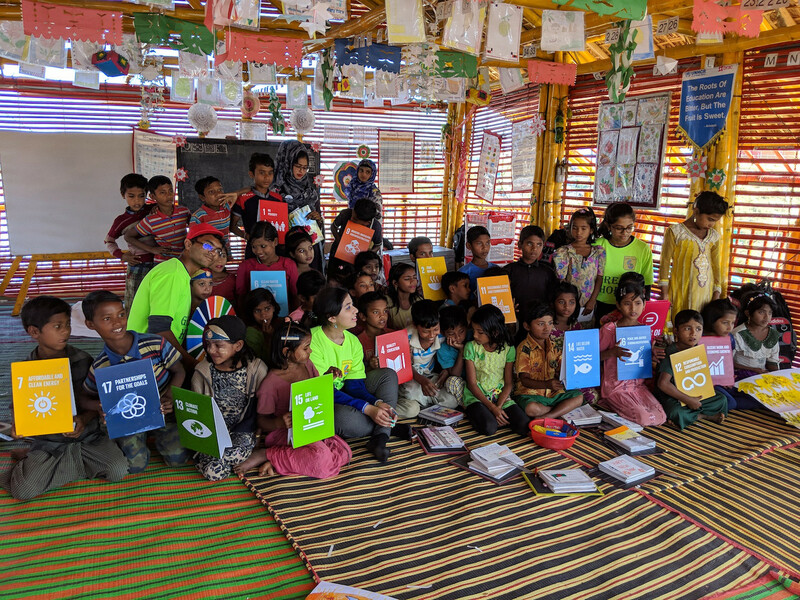 An unsteady bamboo structure serves as a community centre and this is where the Green Hope team conducted environmental workshops for these children teaching them about the Sustainable Development Goals. We spent the day singing and dancing with the children, teaching them about the environment, to avoid plastic, to wash their hands and to conserve water. We sat together and drew our dreams of a clean and green planet. None of these children have been to school and their smiles and joyous laughter were the best Christmas gifts that we could have asked for. Even though we did not speak their language, we used art and music to teach them about environmental conservation. These children had no idea what tomorrow holds for them, yet they pledged to take actions to protect the environment. Their creativity and passion left us spell bound. Eight-year-old Noor Fatima pledged to avoid plastic bags. Whereas, nine-year-old Akramulau drew a picture of a child planting trees. After the workshop, we spent the afternoon planting 100 saplings in an open area behind their huts. Five-year-old Mehendi was amongst the most enthusiastic — her tiny hands as soft as the leaves of the neem sapling that she was planting. Their actions vindicated my belief that every child has the ability to make a difference, all they need is the opportunity. Thereafter we went on extensive field trips to villages, travelling into the Sundarbans, the world’s largest mangrove forest whose rich biodiversity is under severe threat as a result of pollution and deforestation. The amount of plastic litter that we encountered in these remote forests was mind boggling. 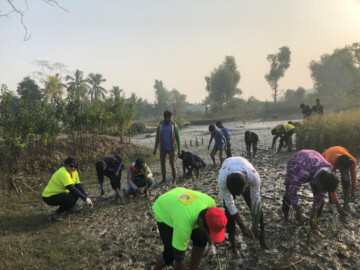 Through our workshops and community activities, which included forest clean-ups and planting over 200 mangrove saplings we engaged residents of three villages in caring for their environment and adopting sustainable lifestyles. We also distributed solar lamps to these villages, which have no electricity. The children in these villages will now have light to study at night and also have some safety from wild animals when they venture out. We spent a day with marginalised rural women who were part of the social innovation enterprise, Grameen Bank, using micro-finance to establish their own small businesses - selling vegetables, tailoring, weaving amongst other means. This was a true demonstration of women’s empowerment, wherein they have broken free of age old social taboos and became financially independent. Fishing is a major source of livelihood and we spent time with the coastal communities, engaging the fishermen on sustainable fishing. Rising sea levels as a consequence of climate change is a major threat to these coastal communities. Reducing global warming and creating natural barriers through tree planting is one solution that we discussed and implemented with the local fishermen. There is so much inequality and marginalisation that plagues our planet - we have pledged to spend 2019 more effectively in bridging this gap. The challenges facing us are daunting but not insurmountable. Green Hope will continue to mobilise young people to bring about greater inclusivity and create a just, equitable and sustainable world for current and future generations.